David Wynne of IrishShop.com talks us though a brief history and some of unique designs and heritage that makes Irish Jewelry so special. Jewelry making in Ireland has a long tradition, stretching back to the ancient Celts and possibly even further into the ‘bronze age’. It was during this time, from 2500BC – 500BC that the distinctive Celtic style of torcs and spirals emerged. More gold artefacts have been found from this period in Ireland than anywhere else in Europe. During the ‘iron age’ which followed the ‘La Tene’ art style flourished in Ireland. This developed the torc style and also the ornate flat discs similar to the Celtic Warrior collection. The introduction of Christianity to Ireland by St. Patrick saw the building of Celtic Crosses across Ireland from around the 8th century. Today, the Celtic Cross pendant is worn worldwide by people to display their Irish heritage and/or Christian beliefs. Around the same time as the proliferation of Celtic Cross building, one of the best known and finest examples of Irish Jewelry – the Tara Brooch was being crafted. This brooch lay buried for centuries before being rediscovered near Tara in Co. Meath in the late 1800s. Replicas of the Tara Brooch remain one of the most popular pieces of Irish Jewelry even today. In the 17th century a Galway man named Richard Joyce was kidnapped from his home village of Claddagh by Pirates. Taken overseas, likely to north Africa and sold as a slave, it while in slavery that he learned the art of the goldsmith and created the best known symbol of Irish Jewelry, the Claddagh Ring. 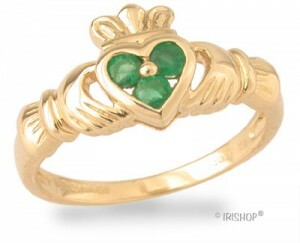 The Claddagh Ring consists of a Heart, representing Love, a Crown, symbolizing Loyalty and Hands which show Friendship. Upon being freed it is said that Richard returned home to present the ring to his true love who had waited for him.This combination of virtues, so truly captured in a single design, captured the imagination of people worldwide as the Irish diaspora spread to countries such as the United States in the 19th century and remains one of the most enduring symbols of Ireland even today. The Triskele: Found at the ancient stone monument ofNewgrange, which predates even the great pyramids of Egypt and Stonehenge, the Triskele sprials are probably the oldest artwork that is used in Irish jewelry design. Trinity Knot: The Trinity Knot is and ancient Celtic symbol which is a symbol of the everlasting as it has no beginning and no end. Sometimes also called the Celtic Love Knot it also represents an eternal love. Ogham Script: This early Gaelic script was carved on stone monuments around Ireland and pre-dates the arrival of St. Patrick. The system of lines representing letters of the alphabet makes ogham jewelry a conversation piece and is popular in personalized Irish jewelry today. Gaelic Script: Modern Gaelic is also widely used in contemporary jewelry design and the best examples would be phrases like ‘Mo Anam Cara’ meaning My Soul Mate and ‘Grá go Deo’ meaning Love Forever which are favorite phrases on Irish and Celtic wedding rings. The Shamrock: It is said that both thegiver and receiver of the shamrock will have good luck. Because of this Shamrock Jewelry is something that Irish jewelry designers return to time and time again. A notable example is Jean Butler, whose Irish nature inspired jewelry features a number of pieces with subtle shamrocks.